As we near the end of 2018, at Winds of Change we reflect on a year that saw great successes in spite of the ongoing, very serious crisis in Nicaragua. Working in cooperation with Seeds of Learning our commitments to the people of Nicaragua included school refurbishments, installing irrigation systems, creation of community gardens, training and certification for welding, and ongoing support for computer skills training. Due to the crisis, we had to adjust our plans. Volunteer trips have been cancelled to Nicaragua until further notice. We cancelled our April trip and moved the November trip to Yucatan region of Mexico. To ensure our commitments were followed through, we sent funds raised by our trip volunteers (about $24,000) to fund projects in Nicaragua. These funds are augmented by our corporate supporters; Lush Cosmetics through their Charity Pot program and Compassionate Eye. The building of a school in Mesa de Acicaya provides an interesting story of resiliency and initiative. This is the project Winds of Change was scheduled to help with in April when the unrest broke out. We were within a few hours of departing when the local situation turned dangerous. Mesas de Acicaya is a remote, rural community located in the municipality of Tipitapa, Nicaragua. Most of the 856 inhabitants are small farmers who grow beans, corn and sorghum. Historically the community has received little support from public and private agencies, which makes development a challenge. The local leadership has organized most of the local projects, using resources raised within the community. In 2017, Seeds of Learning partnered with the Mesas de Acicaya community to build a Learning Resource Center (LRC). The LRC was requested by a group of high school students who belong to a local organization named Caminos al Saber (Pathways to Knowledge). This group of youth is dedicated to promoting access to quality education in the community. In addition to spearheading the LRC project, the youth are committed to running the LRC in the long-term as well as organizing additional educational projects In 2018, the students of Caminos al Saber and local teachers have requested support in expanding the local school by building two new classrooms. The school had just three classrooms for five different grade levels, which meant that some students attended classes during a morning shift while others waited until an afternoon shift. There were also high school classes which operated out of the school on Saturdays, but there was not enough room for all the students. One grade level was forced to hold their classes in the local community center, which has a damaged roof. The two new classrooms, built with support from Winds of Change, will not only alleviate overcrowding and ensure there is enough space for the current students, but will also provide sufficient space for both elementary and high school classes to expand. Construction of the two new classrooms began in April and was completed in November. The project had been delayed due to the political unrest in Nicaragua, but has resumed with financial support from Winds of Change. 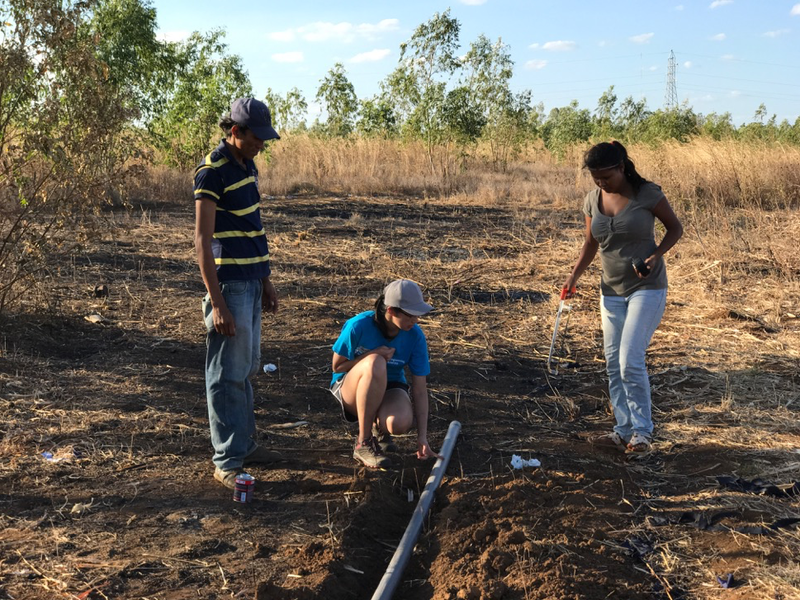 In 2018, two more irrigations systems were built following a model designed by the University of Toronto in rural communities of Tipitapa, Nicaragua. El Triunfo: The first irrigation system was built in the community of El Triunfo. Our expectations for the project were an improvement in the nutrition of the families involved in the project, financial sustainability of the irrigation system, community development through collaboration, and the conservation of water through efficient irrigation techniques. Aside from achieving all objectives, the project raised interest among community members who contacted the women’s cooperative for technical advice for their own irrigation systems. There was also interest in purchasing similar irrigation systems for which the women’s cooperative decided to apply for seed capital to start building the systems in local farms. The women’s cooperative has over 10 years of experience managing economic development projects in Tipitapa. 25% of the produce from the two first crops was given to the local school to complement the feeding programs run by the municipal government. 25% was distributed among the women’s families, and 50% was commercialized locally for future production. Pedro Arauz: For this irrigation system, the expectations were slightly different, but the areas we hoped to impact were the same (economic development, community development, education, environment) The beneficiaries were a family of 4 farmer women whose farming capacity decreased when he mother suffered and accident and could not continue working the land. We expected the irrigation system to positively impact the economy of the family and the neighbors who got involved in the project. We hoped to increase the family’s income so that the beneficiary’s daughters had the opportunity to pay for the cost of their education. Some of the environmental advantages of the system were improved after a visit of a group of engineering students from the University of Toronto who suggested slight modifications on it. We achieved all the goals set for the project and had unexpected outcomes regarding community participation and the conservation of water. This system proved to be more efficient than the ones built before, and the irrigation owner is currently using the irrigation system in collaboration with some neighbors. On April 19th, one day before we were scheduled to travel to Nicaragua with a group of volunteers to build a school, peaceful protests led by university students, were met by violent police and paramilitary forces. Students died that night and in response, Nicaraguans of all classes and communities, the Catholic church and business groups rose in protest. Those protests were met with even more deadly force, to the point that three months later over 270 people, mostly students, have been killed and many more have been injured by police and masked paramilitaries. The population of Nicaragua is about six million, slightly lower than the population of the Greater Toronto Area. Can you imagine the outcry if police and their associated gangs in the GTA shot and killed 270+ students and tortured even more? International organizations including the OAS (Organization of American States), Amnesty International and recently the UN, strongly condemn President Daniel Ortega and his government, including the Vice President - his wife Rosario Murillo, for instigating, propagating and deigning the violence. Nicaraguans continue to protest and face deadly response while demanding to negotiate an end to the violence, justice for the dead, and the acceleration of democratic reforms including an early election. While there has been spotty media coverage outside Nicaragua, the international community has been mostly unaware of the situation on the ground. My own information comes from a combination of traditional media, social media, and live updates from friends on the ground involved in the activities in Nicaragua. The US history of clandestine involvement in Central America, particularly Nicaragua in the 1980s, means that US intervention will be unlikely, but recent sanctions by the US government against several prominent Nicaraguans linked to the violence has been welcomed. Other countries should join the US in more sanctions. So, why am I writing this post after weeks of “sharing” the posts of others? Nicaragua has a special place in my heart. Since 2014, I’ve travelled there five times on service trips and supported over $100,000 of investment in building schools, libraries, community centres, irrigation systems, technical training and even built a windmill. In Nicaragua, $100,000 goes a very long way! The people of Nicaragua got under my skin. I’m proud to call many Nicaraguans my friend. My son, Andrew, has been with me on two trips. On his second trip, he made a short film to capture his positive experience about the magic of the Nicaraguan people. He submitted this film as part of his portfolio to be invited, on scholarship, to join Ryerson University’s film studies program in September. I cannot imagine the anguish that parents of Nicaraguan students face on a day to day basis as students continue to be the front line in this conflict. I encourage you to Google the situation in Nicaragua, watch this film, and share this message with your networks so that together we can raise the awareness of the crisis in Nicaragua with the international community. As Andrew heads off to university in the fall, inspired to be a filmmaker partly due to his time in Nicaragua, I can’t stop thinking how lucky we are to live in a peaceful country where we can disagree but still enjoy peace and freedom of expression. I wish, hope, and advocate that our friends in Nicaragua will soon have that freedom. If you wish to help, share this post. If you want to make a difference, reach out to your Member of Parliament and encourage him or her to raise this issue in the House of Commons. If you want to really want to gain perspective, join me when we return to Nicaragua when things quiet down. 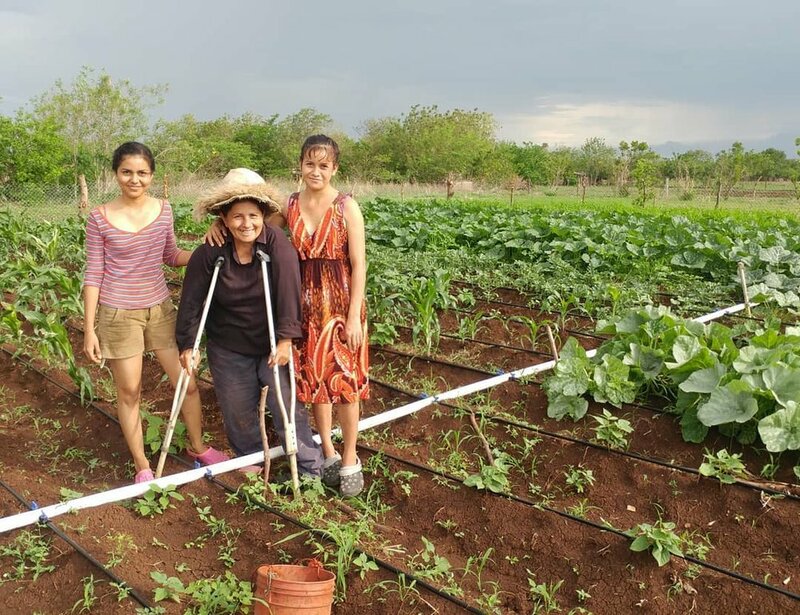 The people in the village of El Triunfo, Nicaragua have built a community garden, irrigated by a system designed by students at the University of Toronto under the direction of Professor Amy Bilton. Preparations were supported by Courtney Lang and Sebastián Martínez with Seeds of Learning. Funding for materials was provided by Winds of Change, thanks to generous donations in Canada. Food from the garden will be shared by the school, community centre and community members who pitch in to help. Welcome to the last issue of In Focus for 2017. It’s hard to believe I just wrote those words as it feels like we were just welcoming this eventful year. As always, CEF has been a rich full experience for everyone involved. This year saw Board members coming and (unfortunately) leaving. Thanks to the dedication of those who decided to join us and those who have moved to other commitments after making a valuable contribution to CEF. We have recommitted to existing partners and started a relationship with two new partners. These partners are the Frances G. Cosco Foundation working in Ethiopia, and Winds of Change working in Nicaragua. We have taken up some exciting goals on generating revenue in new ways and completed some wonderful shoots in Canada, Spain and the UK this year. All in all, we are very excited about the year just ending, and the years to come. Thanks to everyone involved in volunteering, and to Getty for their ongoing and steadfast support. Best of the season to everyone in the Compassionate Eye family. Repaired and painted three classrooms in the village of Ciudelala. The turnout and support from the local community was amazing. We had kids and teachers by the dozens all helping out. Thank you to Tracey McCarthy and other volunteers for the huge donation of school supplies we were able to leave behind! Water samples and sites were assessed for the February Capstone trip by engineering students from the University of Toronto. Winds of Change has been awarded the #1 Capstone project at U of T the last two years so the pressure is on this year's teams to three-pete. One team is working on an improved micro-irrigation project. The other on a low cost water purification system for drinking water. Good luck for great success! Met with members of the community of Pedro Arauz where Winds of Change is funding two instructors to teach and coach community members on computer skills and handicrafts. We also played baseball and left them donated equipment from families affiliated with the Oakville Angels Softball Association. Delivered 14 used laptops generously donated by Seasons Retirement Communities. These will be delivered to 14 teachers on a waiting list maintained by Seeds of Learning. This program is growing quickly, so demand will increase. Met with the community leaders in El Triunfo where Winds of Change is funding the creation of a community garden, and the operation of community resource centre (including its internet connection). While there we learned how to make tortillas, learned about their micro finance loan program and played baseball with the local team. The equipment and uniform donations were greatly appreciated! Amidst all that work we had a lot of fun going to the market, eating, playing cards, learning about Nicaraguan history and politics, visiting a volcano, a fort/prison, and immersing ourselves in local culture. All good. FUTURE TRIP(S): We have begun to discuss our next trip with SOL. Tentatively, we will travel to Mesa De Acicaya, a village in the mountains, to begin construction of a new school. Due to the remote location, the group will stay in the community, likely in tents. We will organize the work week so we can visit a volcano and a fort at the start and still spend some time in Granada at the end. The tentative dates are April 21 - 28th, 2018. This is timed just after most university exams to allow some of the families who have expressed interest. If you know someone I should add to the email distribution, please let me know. This link describes the first project that SOL has been doing in the village. Thank you for your continued interest in Winds of Change. Let me know if you are interested in joining our next trip in April! Update on our Winds of Change fundraising efforts. Interested in connecting with an impressive group of women with a proven track record for making a difference? World Vision does a lot of great work in Nicaragua. We have seen the signs on many infrastructure projects including schools and water systems. But they also invest in people - and have done so successfully with a group of women who call themselves "The Self Group of el Triunfo". With an introduction from our friends at Seeds of Learning, we recently met with six members of the Self Help Group to learn about their vision for the community. 1) Funding and building a learning resource centre (shown in the picture above). They now take turns running educational programs daily at the centre. 2) Creating a managing a very successful micro-loan program for members of the local community. Loans of up to $150 are made to community members who submit loan applications. The criteria for acceptance are feasibility of the business plan, repayment history, and value of the activity to the community. Unlike many other micro loan programs they have a 100% repayment history. That is remarkable! When we asked the team about their future plans for the community they acknowledged that their needs are many, but would like to focus some attention on women's health and empowerment. Longer term, they envision building a community hall and potentially sleeping accommodation for visiting service groups. This could provide an additional source of much needed income to help fund future community projects and make their community attractive to NGOs, like Seeds of Learning, who sponsor service trips. This strikes us as a group who will be successful in whatever they collectively decide to do. If you are interested in working with an inspiring group of women with a passion to make their community a better place, we encourage you to pledge your support to the Self Help Group of el Triunfo. Mount Sinai/Jicartori: The site of the new adobe school is impressive. It looks like it has been a great project. Freddie and the community appears very engaged and enthusiastic. They will meet and gain consensus around how they might address their most pressing shared concern: water. It is an interesting and challenging situation with three quadrants in need of water, and some interesting infrastructure remaining from the plantation that could be used more broadly. It is a complex challenge that will require more assistance. We look forward to hearing more from the community. In the short term, they have asked for assistance with clearing the newly drilled well on the site of the school building. We will discuss as a WOC team if we can fund that immediate repair (~$1000) to provide water to support the completion of the construction and for shared use by the school and local community. Building on the relationships we have established, we returned to Nicaragua April 12 - 20th to check in on previous projects and explore how else we may be able to help farmers and their families in need. We are happy to report that overall the economy is performing well and increased foreign investment is evident in the many new factories that have be been built in the free trade zones. Formal employment options, albeit at low wages, have increased considerably, but subsistence agriculture remains the reality for many Nicaraguans. For each community we will introduce the people and explain their stories in words, pictures and video. Our goal is to raise awareness and modest funding to support the priorities that have been established by each community. Our contributions will include financial support, expertise, donated materials and equipment and labour. Many people have expressed an interest in participating in a service trip. Some of the opportunities we present are well suited for a team to travel to Nicaragua by a small group. Based on the level of interest and success with fundraising, we envision a trip, suitable for families, in the November/December 2017 timeframe. The family pictured above is that of Digna and Eduardo Castillo who were featured in the film The Best of What We Are. We are happy to report that that things are improving for them. After participating in the welding training provided by Winds of Change, both Digna and Eduardo have been hired to help construct the metal framing at the new adobe school at El Jicarito and build metal doors for the school at Ciudalela San Martin. 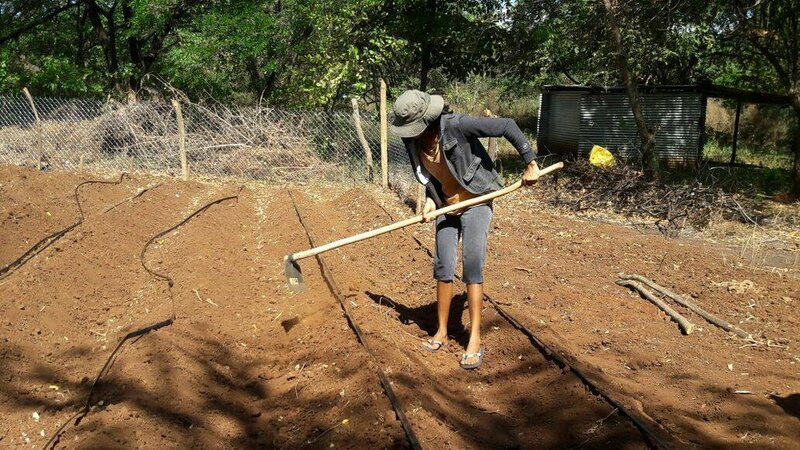 In addition, their small farm has become a model in their community with a new irrigation system, designed by students at the University of Toronto, supporting low impact, organic farming. They are also in the process of implementing a "Bio Digester" that will turn manure into fertilizer and gas for cooking - thus reducing the need to gather wood for cooking. While visiting with them we discussed the potential to plant the remainder of their land with fruit trees and hardwood to help feed the family and provide a retirement income down the road. Their gratitude for the assistance provided by Winds of Change was evident in the warm welcome they provided us. Their tenacity and resolve is evident in their eyes. They are a strong, determined family, and a wonderful representation of the families we continue to meet in Nicaragua. With a new start to the school year underway Winds of Change has now formed two more student teams to tackle the new challenged observed on previous trips. Our new teams will focus on two key areas in the 2016/2017 projects. The first being the cost reduction of the windmill itself. While the original design was mindful of cost and performance, additional modifications can be made to further reduce the overall costing. The team will be looking at the overall dimensions of the windmill vs performance and other areas that can be redesigned for a reduction. The second of our team will be engineering a low cost, packaged irrigation system for use within this and other communities. Low cost / hands-free irrigation is a vital part of survival in these harsh conditions and will often make the difference between a successful vs failed growing season. More news to come as the teams continue their pursuit! The Team is heading back July 11-15, 2016! The WOC team will be heading back to our community to continue work on the existing windmill and evaluate additional projects within the community. While we worked hard to get our first windmill up and running earlier this year we recognize that this is only the first step in a long partnership within the community. On this trip we will be conducting repairs and upgrades to the existing structure as well as proposing additional projects to community leaders. Look for additional updates in the weeks to come! GREAT NEWS! The first Wind Mill from Winds of Change is in place. There were some moments of excitement, but it's up! Congratulations John Shoust, Amy Bilton, Wayne Scott, Julian Guevara, our friends in Pedro Arauz and the great team of engineers from the University of Toronto. 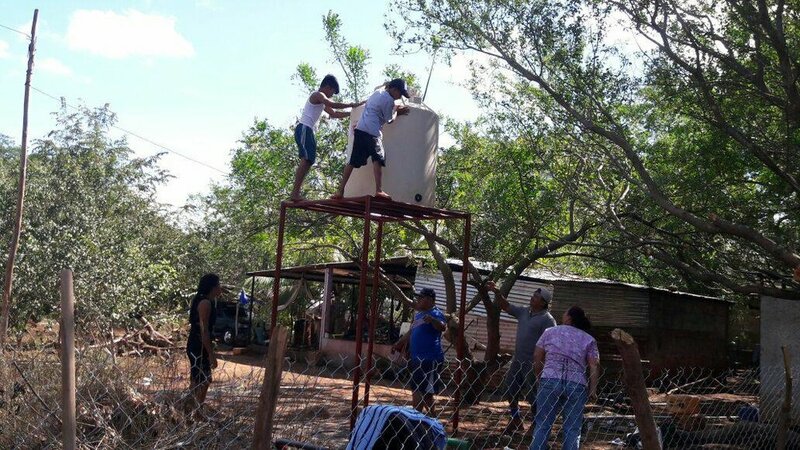 Over the past seven days the team from University of Toronto has worked along side the people of Pedro Arauz to turn basic materials from the local hardware supply store into an innovative new way to irrigate the community garden. When the water began to flow from the pipe there was a collective cheer and sigh of relief. As the wind was quite strong we were also able to witness the newly designed automatic break kick in an disengage the rotor when the wind hit the threshold. While there is still work to do to prove that the design can sustain its performance over time, we can enjoy success at this important milestone! We're coming back ... the windmill is ready! On January 13th, the Winds of Change team will arrive back in Pedro Arauz, Nicaragua to construct our first windmill. If things go as planned, on January 19th water will be lifted from the village well using the existing rope pump - but now the pump will be fitted with a windmill designed by Mechanical and Industrial Engineering students from the University of Toronto. The initial design, done by four members of the class of 2015, has been refined and improved by two teams of four students each from the class of 2016. The mission of Winds of Change is to bring innovative, cost-effective technology and support to help impoverished farmers in rural Nicaragua. Newly designed windmills will be used to pump small amounts of water from existing wells to support sustainable farming practices including micro-irrigation. This will help families to grow more food, particularly in the dry season. Doing so will help provide needed nourishment and income to lift them from poverty. 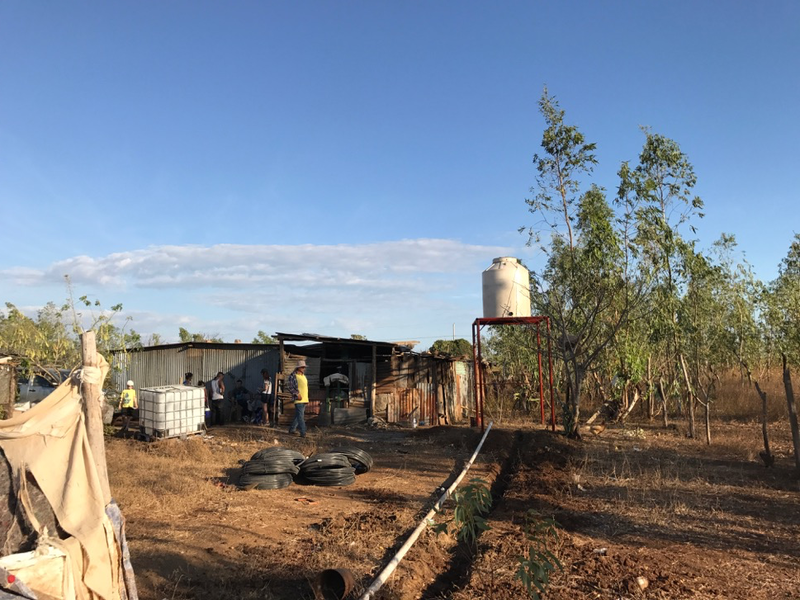 Our friends in the village have already constructed the water tank into which the water will be pumped, and the community garden that will be irrigated. This project has been about eighteen months in the making. We're pumped! (pun intended). A big THANK YOU for all of the support! Watch for more updates as the trip approaches. On September 15th about thirty people gathered at Laurier's Toronto office to learn about Winds of Change. They heard from Julian Guevara who was visiting from Nicaragua as well as the Winds of Change leadership group: John Shoust, Wayne Scott, Amy Bilton and Rob Scott. Many thanks to the team at Laurier and the great people at Students Offering Support for all the assistance!